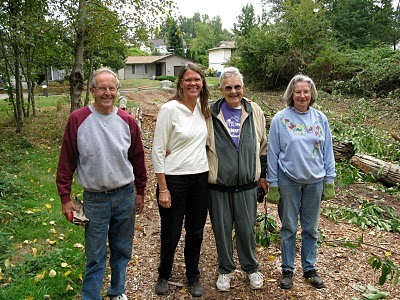 We were sad to hear of the death of Charlotte Valbert, one of our Garden Crusaders, who lead the effort to reclaim a blueberry garden in South Tacoma, WA. There are more than 20 acres of lovingly reclaimed, mature blueberry plants, and every one of those berries is free for the picking. Charlotte and I with two of Blueberry Park’s most dedicated volunteers. Each of our Garden Crusader winners is someone very special, doing something amazing in his or her community. In the fall of 2008 I spent the good part of a day with Garden Crusader Charlotte Valbert of Tacoma, Washington. Charlotte had agreed to give me a tour of Blueberry Park, the project for which she’d received the award. Though the park was just a few blocks from her house, it took almost an hour to get there. Charlotte seemed to know everyone we passed — or, I should say, didn’t pass. She pulled over about every 200 feet to talk with one person or another about a pending issue at City Hall or an upcoming clean-up event. Driving up and down the streets of rough-and-tumble South Tacoma, I saw for myself the dearth of trees, lawns and open space. When we finally arrived at Blueberry Park, it was an oasis of green. Of course, that neighborhood tour was no accident. At 80-years-young, Charlotte was always working it. She had a vision and she made it a mission. It took her eight years of lobbying city officials and rallying more than 2,000 volunteers to turn 27 acres of tangled brush into a park for her neighbors. There are now shade trees and picnic tables, and places for kids to run around on the grass. But the main attraction is blueberries. There are more than 20 acres of lovingly reclaimed, mature blueberry plants, and every one of those berries is free for the picking. Charlotte was a really cool woman and so deserving of the award. We were very sad to hear of her passing on Monday, Aug. 16. The Tacoma News Tribune has dozens of tributes to Charlotte — a beloved member of her community, who believed that everyone deserved access to the beauty of nature and to fresh, healthy food.